I think it's interesting how some model names where reused for different models and other times there was a roman numeral addition to the name like II, III, etc. I guess the latter could be considered a series of models such as; the Storm King models, Rotomatics, even the initial Accumatics. Other times just the same was reused, such as the Drake, or Martin. Still, there isn't always a rhyme or reason for the reuse and the family resemblance, if there is one, isn't very obvious. A good example is the Boatswain, Boastwain II and Boatswain III. The latter is nothing like the initial two. Go figure. A very small family of watches might be defined but the two Seaman models, the 1962 Seaman and the 1966 Seaman II. They have a very strong family resemblance and could easily be twins. The are also both one-catalog wonders... the Seaman was only shown in the 1962 catalog and the Seaman II was only in the 1966/67 catalog. Looks like the biggest difference between the two models is the price tag - a $20 decrease between the 1962 and 1966 versions. An astute eye might notice the Seaman appears to have a pearled minute track where the Seaman II has hash marks. The contour of the lugs is slightly different too. Of course, the hands are different shapes as well. My project watch is an interesting example. Notice it has the original Seaman-style hands. That's not terribly unusual, as the factory was known to use whatever worked during busy times of the year like preparing for graduations or Christmas. The crystal has a large scrape so the dark blemish on the dial is actually just the crystal. The SWISS on the dial, sweep second hand and the flat back are good indicators that there's an ETA-based movement inside like the 688. This is a one-piece case so the movement comes out the front after the crystal is removed. I'll use a small lever to separate the two-piece stem and pop the crown off. Then I can remove the crystal and lift the movement out. Based on the number scrapes and scratches on the crystal, I think a new crystal will be a huge improvement. As expected, there's a 17 jewel Hamilton 688 movement inside. It looks like it was never touched since it was initially installed. Check out this textured dial. I doubt this dial could be refinished to look like new again, good thing this one is perfect. The inside of the case back shows no signs of previous services. It's also interesting to see the model number 921565 ends with 65. 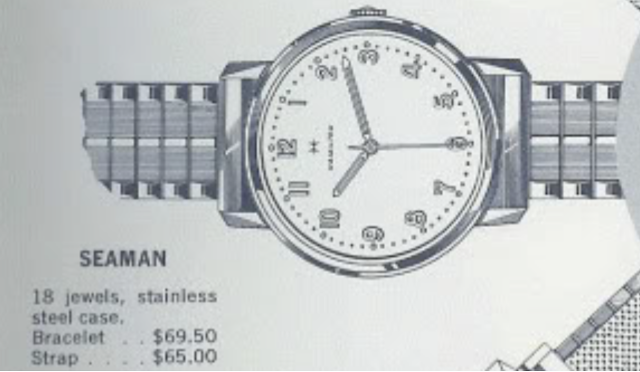 That would indicate this watch was created in 1965, probably after the 1965 catalog was released so it became a 1966 model. The number beginning with R is the unique serial number for this watch. A new 29.5 high dome crystal is ready to be installed. The movement is cleaned and ready to be put back together. The reassembled movement is back to ticking away with good motion. Now to see what the timer says. Well, running a little fast but the amplitude is low and the beat error is on the higher side. Well, I reduced the beat error and the amplitude came up but it's just barely over 200 degrees. That wouldn't be terrible if this was a pre-1940 movement with a set mainspring but I would rather see an amplitude in the mid to high 200's. When I see moderately low amplitude I first check the barrel to make sure that it's not dragging. Sure enough, it wasn't completely closed... it was close but not closed. Well, this 1966 Seaman II looks and runs like it just left the showroom display case. The only distractions to my eye are two specks of polish compound near the lugs and a piece of fiber on the lizard strap - all are easily removed. 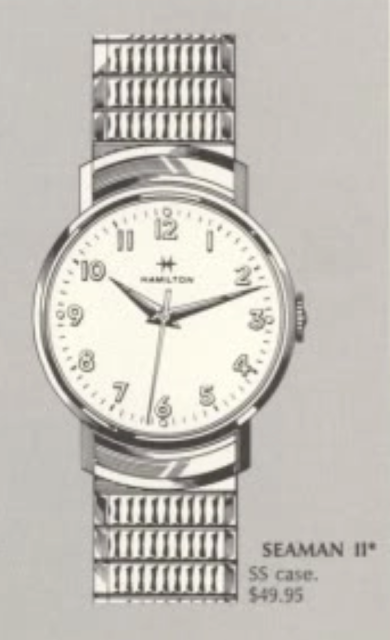 Hamilton's first automatics were introduced in 1954. Some models continued to be made in 1955 but several early automatics were one-year wonders including the Automatic K-301, K-350, K-400, K-401, k-K-450, K-502 and K-550. That means seven of the first 12 Automatic models were only produced for a single year thus making them some of the most difficult models to find today. One of them, the Automatic K-450 recently made its way back home to Pennsylvania for some homemake pumpkin pie, traveling all the way from Hawaii. 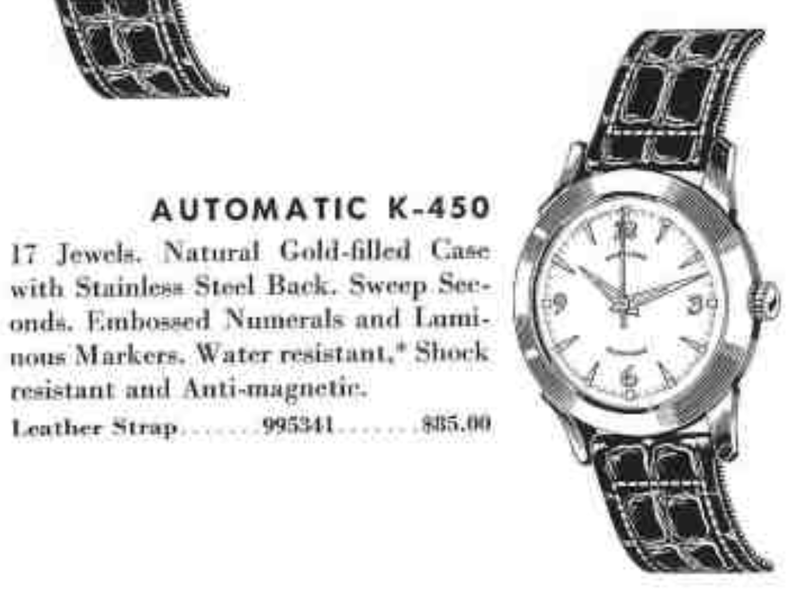 The K-450 was the first Hamilton automatic to have a gold filled bezel with a stainless steel back. The movement inside is likely the 17 jewel 658 movement that was used in the earliest K-series models before the 661 workhorse was introduced. Although I don't know exactly when the 661 was introduced. My K-450 project watch is a bit worn with a very scratched crystal but looks promising. It's making a loud clunking sound inside so I suspect the rotor inside has come loose. The stainless steel back is a sturdy design and should be easy to unscrew off. Sure enough, the rotor has come loose. The 658 is identical to the 661 except for the oscillating weight design. The weight rotates on an axle. On the 658 the weight is secured to the axle with a screw that goes over a post. You can see below that the post is broken off so there's nothing to secure the rotor to the framework. This movement isn't very common so I can either leave rotor off, making this just a manual-winding watch, or I can replace the broken parts with parts from a 661 and use a 661 rotor. The hole in the jewel in the rotor is larger than on the 661. It looks to me like the post for the axle is still stuck in the axle. So I will either need to find a new axle or replace the whole assembly. Based on the appearance of the movement, it's been a while since this watch has seen a watchmaker. At this point this movement looks exactly like a 661 without the oscillating weight. The inside of the case back makes identifying the model easy. The rotor must have been rattling around inside for a while, as you can see the back shows a lot of rub marks. Based on the general appearance of the dial and the numbers scratched onto the back, this dial was refinished at some point. It still looks good though. Looking closely at the bushings in the framework, one of the holes has been worn into an oval, so I will replace this framework with better one from a 661. The movement is now running with a nice motion. The barrel bride has lost some of its nickel plating and has a slight yellow color. The watch is running a little slow but the other specs look good. A very slight tweak to the regulator fork speeds the watch up nicely. 9 seconds fast per day is a good stopping point. This watch definitely needs a new crystal. A 28.3mm high dome crystal will do the trick. Voila - the movement is reinstalled in the case and is now effectively a 661 and fully functional as an automatic. This watch turned out great. Considering I've never seen a K-450 until now I can honestly say this is the nicest K-450 I've ever seen. What do you think? Today is Christmas and all across the world people celebrate the birth of Christ in different ways but universally with the hope for peace on Earth and goodwill toward men. It's a bit of a paradox really, most Western nations celebrate Christmas as a national holiday but wishing people "merry Christmas" often feels politically incorrect. You would think the idea of peace on Earth should resonate with everyone, but alas, no. I don't know about you but "happy holidays" just doesn't cut it, although I do respect the faiths of other people. I recently saw a bumper sticker that said, "No Christ, No Christmas. Know Christ, Know Christmas" and I thought it was a great reminder of the reason for the season. “No space of regret can make amends for one life's opportunity misused”. If you recall, Bilbo's accidental response was "time". Time is our most under-appreciated gift. We think we'll always have it so we often waste it. Eventually we learn to value it more and more. You've heard the phrase "time is money" but the opposite is certainly not true. With time you can make more money but you cannot buy a moment's more time - when your time is up. No one on their death bed asks for more money. Our time on Earth is limited and if we are wise we will share it with others, especially our family. Time is an abstract concept and one that I occasionally ponder - especially when I look up at the moon and consider how everyone who has ever lived has gazed upon the same sight, regardless of when or where they lived. When it comes to the moon, we are all connected. The same seems to be true with watches but to a lesser degree. 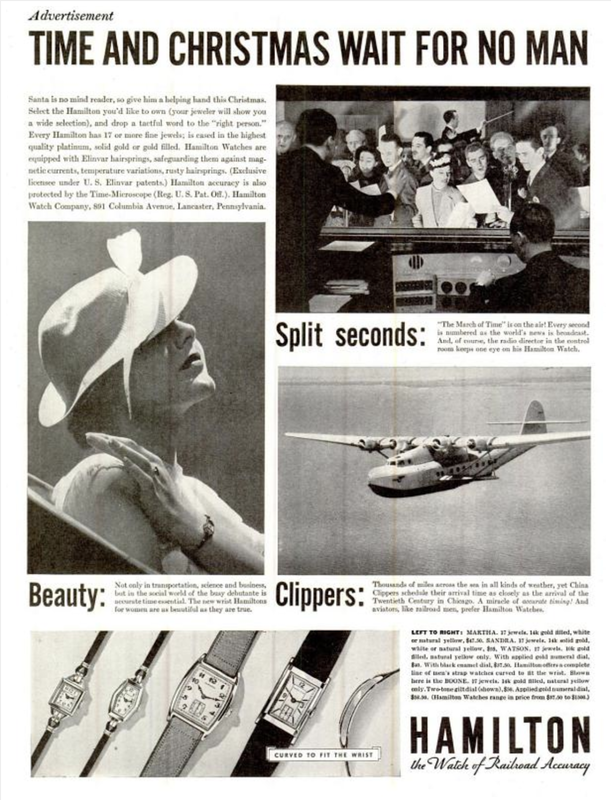 Watches not only tell time, they span time and connect generations as treasured heirlooms. It's a concept that Hamilton included in their 1930's marketing... Time and Christmas wait for no man. For this Christmas post I thought I'd share another ghost of Christmas past, and it's one of my favorite models - a Tonneau Engraved from the late 1920s. The model was originally introduced in 1927 and was produced through 1932. It came in both solid gold and gold filled, initially in green and white gold but later in yellow gold too. My project watch is a green gold filled example with an interesting chain bracelet. The ancient plastic crystal is a type that outgassed a chemical corrosive to steel. So the hands behind the crystal are crusty and the dial could stand to be refinished. If you look closely you can see there is still black enamel in the engraving on the bezel. This watch was a Christmas present from Jennie to Milford in 1929 and it's nicely engraved by hand. This is becoming a lost art. The movement inside the case is a 17 jewel 6/0 size 987 and the serial numbers indicates it left the factory in April, 1928. The number 1110 stamped on the case is the last four digits of the case serial number and matches the inside of the case back. A new glass crystal will make an immediate improvement to the watch's appearance. Everything is completely disassembled and ultrasonically cleaned. Now it's ready to be reassembled with fresh lubricants. First I'll have to install a fresh mainspring. This new 6/0 sized Dynavar mainspring will give the watch plenty of life. The reassembled movement is ticking away with good motion... now it's off to the timer. Not too shabby for being 90 years old... 36 seconds slow per day can be easily corrected with a slight tweak to the regulator. Although the case still has some black enamel in the engravings, I will add a little more with a paint pen. The Engraved version of the Tonneau is defined by the engraving on the bezel. The center portion of the case is engraved on both versions of the Tonneau, plain or engraved. This fine detail is one of the reasons why the Tonneau is a favorite model. The finished watch looks fantastic. I think this may be one of the nicest gold filled Tonneaus I've come across. There is absolutely no wear through that I can see anywhere. The bracelet shows some wear but it looks like Milford might have only worn this watch only on special occasions. Wherever Jennie and Milford are, I hope they enjoyed a long life together. I wonder how many Christmases they celebrated together? "Scrooge was better than his word. He did it all, and infinitely more; and to Tiny Tim, who did not die, he was a second father. He became as good a friend, as good a master, and as good a man, as the good old city knew, or any other good old city, town, or borough, in the good old world." So if you're like me, and I hope you are, I hope your heart will laugh a little too, and together we may all strive to know how to keep Christmas well. Have a wonderful Christmas and best wishes for a joy-filled 2019! I think the most popular men's watches today are chronographs. In fact, I've seen lots of men wear watches that look like chronographs but lack the functionality and just have the styling. Chronographs are watches with a stopwatch complication. So in addition to telling the time, it also has the ability to start, stop, and reset a separate stopwatch. Sometimes the watch will record time up until 30 minutes and others will record upwards of 12 hours. In addition to a stop watch, some Chronographs will include a separate scale called a Tachymeter. This unique scale can be used to estimate the speed of something based on travel time or to measure the distance of something with a known speed. The scale of the Tachymeter is based on 1/t, where t is the elapsed time. A tachymeter essentially converts elapsed time (in seconds per unit) to speed (in units per hour), regardless of the unit of measure. Hamilton made a number of Chronographs, albeit a small number, starting in 1968 with the Chronograph A & B. They also made a dive watch in 1970 called the Chrono-Diver. The first chronograph that Hamilton made was the Model 23 Navigators Watch used in WWII. Automatic versions of chronographs were also produced called the Chronomatic with a letter A, B, C, etc. to denote differences in models, all the way up to E.
One oddity is the same nomenclature was true in Chronographs, starting with the A, but there is no C, D, E, or F and the only lettered Chronograph after B is the 1974 Chronograph G. It was produced for three years. However, there is a Chronograph 360 that looks a lot like the Chrono-Diver but without the rotating dive bezel. 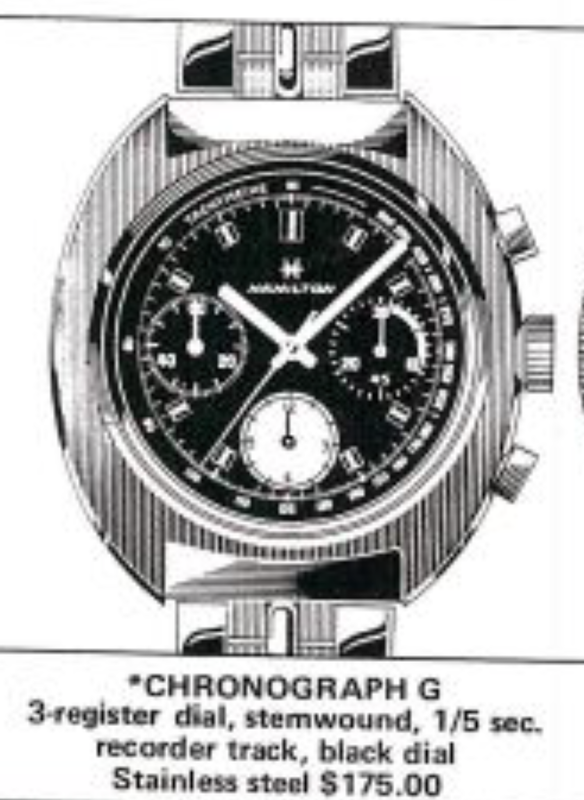 So for the manual wind Chronographs you have the A, B, Chrono-Diver, 360 and the G.
When you look at the catalog description of the Chronograph G, it features a three-register black dial, the only model to have three registers. Inside the case you will find a 17 jewel Hamilton caliber 640, which is based on a Valjoux 7736. You'll find this same caliber behind the dials of all sorts of watch brands. Although the movement was commonly used, I have found the hardest part of maintaining a chronograph from this era is getting spare parts, especially the watch hands. 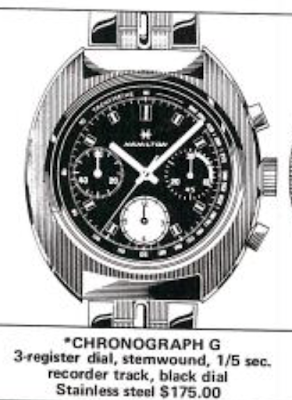 I would strongly warn any interested collector to tread carefully in the realm of chronographs. They can be very costly to repair, and in some situations (like the Chrono-matics) they can be near-impossible to repair for anyone other than the rich and famous. That said, a friend of mine recently sent me his Chronograph G in need of some TLC. It's an interesting watch and although I don't have the experience to repair it, I did want to take it on and shot it on the blog. This example also came with it's original bracelet. The watch runs but the chronograph doesn't function correctly. One thing to note right from the start is this watch dial has faded quite a bit. The second hand, five minute indexes, and the hour register all should be bright orange. Perhaps this watch spent a lot of time in the sunshine in the last 40+ years. Just to orient you, the upper push button starts and stops the stopwatch. The lower push button resets the stopwatch to zero. The right register records minutes, up to 30. The lower register measures elapsed hours and once the first 30 minutes elapses the hour register moves half an index. In the shot below you can see the case is a Biot scratched up and the crystal is deeply gouged along the top. The crystal is also scratched up so a replacement is definitely in order. The bracelet looks good, but it can stand to be dressed to remove the scratches. Although the bracelet has a prominent H on the clasp, the bracelet is made by Baldwin. This model is also known by the model number 640001-3. The 640 / Valjoux 7733 looks pretty complicated. It basically has the parts for a stopwatch strapped onto the back of a manual winding watch. Well as I said, this watch is out of my league, at least for the time being, so I sent it to my good friend Raimond Irimescu, a 4th generation watchmaker, at www.paulswatchrepair.com. Raimond is my go-to guy for missions impossible. He's not always successful but he's almost always willing to give it a go. If you want to send him a project or two, let him know HandyDan sent you. He'll do a great job for you. As you can see on the shot below, when the watch came back it was running excellently. My finished watch looks fantastic. If I had a complaint, it would only be that dial is less orange than it should be... but in the end, who cares? This is an awesome watch. Even the bracelet looks much better now. The case back looks super too. It kinds of makes me wish this was my watch! At least it will be mine for a little while - then I'll have to give it back.